Most people think there are five Great Lakes, but from one point of view, there's actually a sixth. It's sitting under our feet. It's called groundwater, and in our region, its volume equals that of Lake Huron. Now, that abundant volume of groundwater is not literally a lake. Rather, it is typically found in tiny pore spaces between particles of soil and rock, sometimes creeping only inches a day. 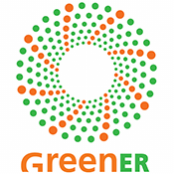 You can’t swim in it – but you can drink it, water lawns and crops with it, and power industries with it. We do all those things in Michigan. Most importantly, 45% of our population draws its drinking water from groundwater sources, either from one of our 1.25 million private residential wells or from one of over 12,000 public supplies. 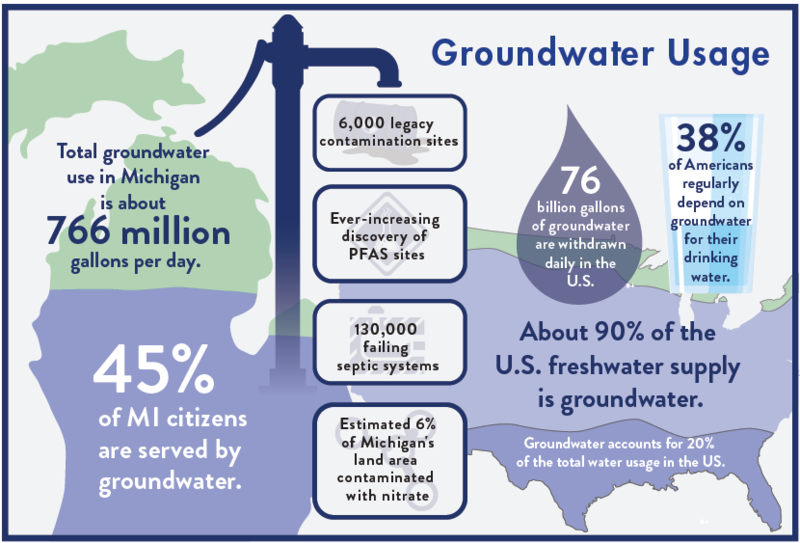 Regrettably, Michigan’s groundwater is stained with hundreds of thousands of sources of contamination, ranging from failing septic systems to farm fertilizers to ancient, abandoned industrial sites where chemicals were used. 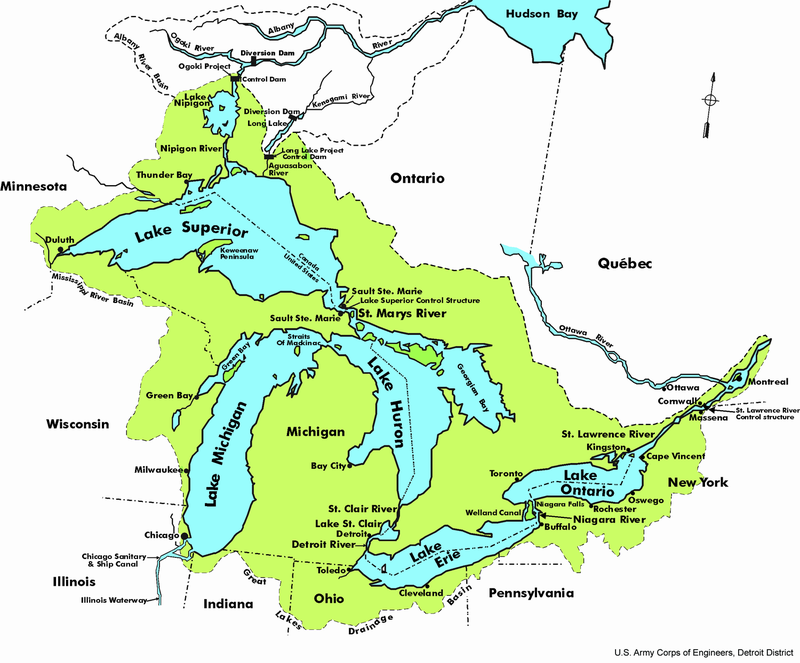 We can and must do better to protect our sixth Great Lake. 1. What is the source of your household drinking water? 2. Where does your household wastewater go? 3. Where does your household refuse end up? 4. How much water does the average residence in Elk Rapids use? Answers to these questions will appear in next week’s Elk Rapids News. The first person to respond with correct answers to website www.greenelkrapids.org will receive a copy of “The Waters of Michigan” by David Lubbers. The Village of Elk Rapids supplies drinking water to nearly all of the residents and businesses within the Village limits and a few buildings outside the Village limits, and it is sourced from 3 village owned groundwater wells within the city limits. Pumped water is chlorinated, fluoridated, and treated to sequester iron and coat the inside of the pipes before it flows through water mains to homes and businesses. Coating the inside of the water mains and water services is done to control corrosion and keep lead and copper from dissolving in the water. Water pressure and storage of water is maintained by the 200,000 gallon elevated storage tank along US-31 on the south side of the Village. 2. Where does your household wastewater go? Wastewater flows by gravity from homes and buildings through a network of sewers within the Village. There are a few small pumping stations for individual buildings in the Village. There are also a number of individual pumping stations around Birch Lake that pump wastewater in pressurized pipes (pressure sewers) to the treatment works north of the Village. Where the terrain is not conducive to gravity flow, a large wastewater pumping station conveys sewage in sewage force mains (pressurized pipes). There are several of these large pumping stations located throughout the Village. A couple of the pumping stations convey nearly all of the Village’s wastewater to the treatment works north of the Village. At the treatment works, the wastewater is aerated to promote the growth of naturally occurring bacteria that treat the sewage. Coagulants are added to remove phosphorus from the wastewater to reduce algae growth in the receiving water. The solids settle to the bottom of the treatment lagoon and the treated effluent flows through a clarifier to further remove solids. The clear water effluent is disinfected and then piped to the downstream side of the dam and discharged into the Elk River. Household refuge that is taken to the Village’s compactor, is hauled by American Waste to one of their sorting facilities either in Kalkaska or Traverse City. American Waste places the waste on horizontal conveyors where wood, metals, plastics, paper, glass, and other recyclables are removed. The recyclables are taken to various markets and American waste transports the non-recyclables to its landfill in Wexford County. 4. How much water does the average residence in Elk Rapids use? Our large seasonal population may skew our averages, but in general, people in this part of the country use about 75-100 gallons per capita per day. Assuming three persons per residence, the average use would be about 300 gallons per day.